Sonnet Designs: Is it present time yet? This is my first stamp from The Cat's Pajamas...isn't he cute? It's called Bearing Presents. Copic colored of course, and I used some dp I got from my LSS Scrapbookers Anonymous. 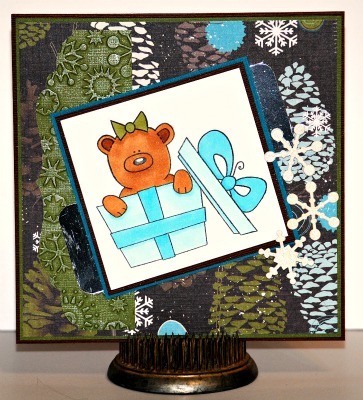 Iused my snowflake cuttlebug die to create those snowflakes on the side. I used glitter paper for them too, for a bit of sparkle. I love the bear. Thanks for joining Paper Sundaes. SO CUTE!!! Thanks so much for joining us at The Sisterhood ‘CHRISTMAS’ challenge and please come back again soon! What a fun card. I love the bear and snowflakes. Thanks for playing at CTO! This is fantastic card and a very beautiful design. Too cute Janet. Love the little bear image. Thanks for joining in the Christmas Challenge at Mad for Markers.